I’ve written in-depth articles on a pretty wide range of topics; that potential diversity was one of the reasons I was attracted to feature and magazine journalism in the first place. I think I’ve been drawn, in several of my features, to people whose lives have been changed, immeasurably, often in an instant. 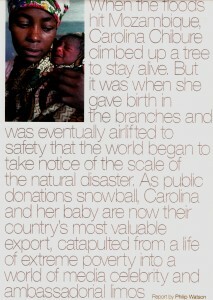 A good example of this is Carolina Chibure, a woman who remarkably gave birth to a baby girl in a tree during the devastating floods in Mozambique in 2000. I first caught up with her in Washington DC, when she had become, almost overnight, not only her country’s most valuable asset and export, but also, as the Telegraph put it (left), “catapulted from a life a extreme poverty into a world of media celebrity and ambassadorial limos”. Seven years later I travelled to her village in southern Mozambique to see how she and her daughter Rosita were faring. I looked at young lives tragically transformed by a rather more man-made disaster, Chernobyl, again in a companion pair of pieces: a feature for the Irish Times on two 11-year-old girls from Belarus who came to stay with my partner Jacqueline and me in Ireland; and a follow-up piece for the Telegraph Magazine, when we visited Tanya and Katya in their home village three years later. 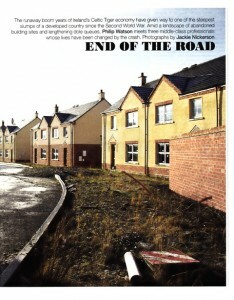 Three people powerfully affected by the dramatic and disastrous economic crash in Ireland also featured in the piece End of the Road. The article serves as an interesting counterpoint to a rather more buoyant article I wrote a few years earlier in 2007 at the height of the Irish boom, about the runaway Celtic Tiger CRISPIEs – the Cash-Rich Irish Seeking Property in Europe (or anywhere else in the world for that matter, at that time). 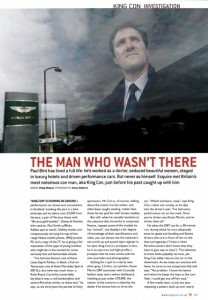 There is a story on the life and times of Britain’s most notorious conman, Paul Bint, aka King Con; a crime story of a rather different kind took me to Macedonia to investigate the baffling and bewildering case of Vlado Taneski, a journalist charged with committing a series of gruesome murders on which he himself had reported. To read further examples of my feature pieces, click here.